The order Hymenoptera gets its name from two Greek words. The first word - "hymen" - means membrane, and the second word - "ptera" - means wings. The name also refers to the Greek god of marriage, Hymeno. This refers to the wings being joined together as one. Bees, ants, wasps, and sawflies all comprise the order Hymenoptera. Insects of the order Hymenoptera typically have two pairs of wings. Some, however, do not have any wings for most of their lifespan, such as ants. They have antennae with 10 or more segments. Males usually have around 13 segments, and females usually have around 12 segments. The antennae are longer than the head. All of the insects have chewing mouthparts, but some groups have a "tongue" that is used for lapping up fluids like nectar. The two pairs of wings are joined together by the hamuli, which is a row of hooks that attach the rear wings to the front wings. The body itself is made up of three parts: the head, the thorax, and the abdomen. The head contains the antennae, the mouth, and the eyes. The thorax has the wings and legs. The abdomen contains the digestive and reproductive organs, along with the stinger. Hymenoptera reproduction is unique because the females decide which eggs to fertilize. The eggs that are fertilized will grow into females, and the unfertilized eggs will grow into males. This is because of the chromosomes that the egg receives. Fertilized eggs get two sets of chromosomes, and become diploid females, and unfertilized eggs only get one set of chromosomes, and become haploid males. Since the females control which eggs are fertilized, they control the percentage of males in the population. The first stage of the life cycle is the egg. During this stage, females decide which eggs will become males and which ones will become females. The next stage is the larval stage. Most larvae are comparable to grubs, but the sawfly larvae are similar to caterpillars. Next is the pupa stage, when the insect starts to mature into its final stage. Finally, the last stage is the adult stage, when the insect has fully grown. Many species of Hymenoptera live in colonies. Ants and bees are great examples of this. Ants usually live underground and work together to supply food for the queen and the rest of the colony. Similarly, bees make hives and work to produce honey. Many insects of this order feed their young the meat of other insects, while others feed them pollen. The adults feed on nectar, and as such can often be found very near to flowers. Many insects of this order are considered pests, but some are extremely helpful. 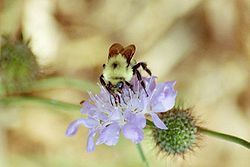 Some members of Hymenoptera prey on other insects that could cause damage to crops or other such things, and bees help flowers to reproduce through pollination. Other members, though, are an extreme nuisance. Ants usually ruin houses, and wasps can sting you. Most stings will result only in a little swelling, but for some people, the stings are very deadly. Despite this, a lot of the insects in the order Hymenoptera are very beneficial to humans, whether we know it or not. This page was last modified on 19 September 2014, at 19:33.